The head of the Federal Motor Carrier Safety Administration (FMCSA) said the agency is still reviewing the 5,200 public comments it received regarding potential changes to hours-of-service regulations. 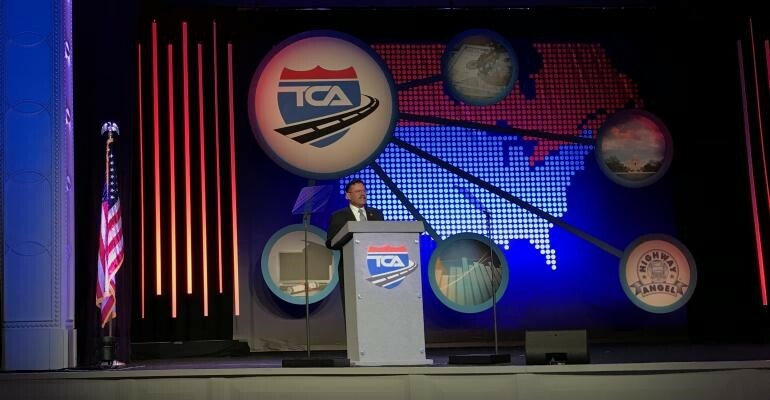 “We are very encouraged with the quantity and quality of comments we received,” Ray Martinez said March 12 during an appearance at the annual conference of the Truckload Carriers Association (TCA). Martinez said the data generated from the mandatory use of electronic logging devices (ELDs) allows the agency “to take a serious look at HOS.” He noted that statistics showing far fewer HOS violations during roadside inspections helps make the case for some HOS relief for truckers. He called 2019 “a critical year,” as everyone continues to adjust to regular use of ELDs, and a clause allowing early adopters of automatic onboard recording devices (AOBRDs) expires in mid-December. Martinez pointed out that last year’s TCA conference was one of the first trucking industry events he attend as administrator, and he was appreciative of the warm reception he received. He said he hoped that was a sign the industry was recognizing the more collaborative tone the agency has put forth during the Trump administration. FMCSA does not believe a higher level of safety is achieved “by more laws and more regulations, necessarily. It happens because of the culture of safety you have in your companies,” he said. One area that Martinez said will further enhance driver safety is the drug and alcohol clearinghouse. Scheduled to go live in January, he said it will better ensure all commercial drivers are alcohol and drug free. During a TCA session one day earlier, Eric Fuller, CEO of U.S. Xpress Enterprises, said the clearinghouse could have a more significant effect on reducing the overall driver pool than the ELD mandate. Meanwhile, Martinez received applause from the TCA audience after stating he hoped to make permanent a program that allows carriers to request reviews of non-preventable crashes that otherwise would hurt their overall safety scores. This is not only beneficial to drivers and carriers, but also FMCSA because it “doesn’t want bad data that skews the larger information we are after,” he said. On a separate topic, Martinez said the agency is expecting to publish an advanced noticed of proposed rulemaking in the spring to gain industry input on advanced safety technologies and automated driving systems.